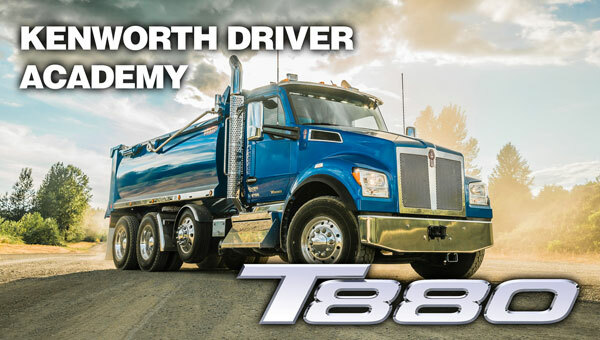 Kenworth has launched the T880 Driver Academy training video series for customers operating Kenworth’s T880 flagship vocational model. The T880 provides a durable, reliable and productive truck for vocational fleets and truck operators in mixer, dump, heavy haul, bulk haul, oilfield, logging and refuse applications. “Our new T880 Driver Academy video series is an excellent resource for drivers to use to quickly and easily learn about some of the key functionality of their Kenworth T880 and maximize operational efficiency. Fleets can also take advantage of the fast-paced, one-minute videos to help train drivers moving into T880s,” said Kurt Swihart, Kenworth marketing director. The 16 T880 videos focus on such topics as Cab Comfort, Seat Adjustment, Fuse Box and On-Board Diagnostics; Switches, Cab Climate, and Gauges; Kenworth Driver Performance Center; and Kenworth Power Management; among other pertinent topics. Instructional topics will be added to the series as new options and technologies are introduced. The videos will be coming soon to the popular Kenworth Essentials App, which can be downloaded to smartphones and tablets from the Apple Store or Google Play Store by searching on “Kenworth”.